Rivers made Portland. They were the avenues of exploration, pathways for settlement, and arteries of commerce that made–and still make–Portland a commercial gateway to the American Northwest. Both Native Americans and the first European American visitors traveled by river and judged the landscape from the water. At the site of Portland they found low, sandy islands, separated by shallow channels from tangled bottomlands and backed by rising hills or bluffs, such as Ross Island–Oaks Bottom and Swan Island–Mock’s Bottom. Marshes fronted the banks where streams reached the Willamette through Sullivan’s Gulch, Marquam Gulch, and the creeks the flowed through what are now the Brooklyn and Hawthorne/Buckman neighborhoods. Shores were tangles of willow and vine maple.. There were two large sets of seasonally flooded lakes that dominated larger shelves of low-lying riverfront land. One was along the west shore of the Willamette starting with Couch’s Lake and continuing through Guild’s Lake, Kittredges’s Lake, and Doane’s Lake. The second along the south shore of the Columbia between the river and the slough, where Smith and Bybee lakes were multiplied 6 or 8 times. When the Europeans arrived, thousands of Chinook speaking villagers had concentrated where it was easiest to harvest fish and waterfowl–especially Sauvie Island, the adjacent Multnomah Channel, and the mouth of the Clackamas River. For Lewis and Clark, the riverscape was low enough and tangled enough that they missed the mouth of the Willamette on their way to the Pacific. On the way back, they got as far as the Quicksand River before Clark doubled back past Image Canoe Island and found the channel to follow upstream to roughly the site of the University of Portland. Initial European-American settlement had to squeeze onto places where firm land sloped down to the rivers (neither the marshes nor high bluffs). As the California gold rush created a booming San Francisco market for Oregon wheat and lumber in the 1850s, newly settled Portland struggled to establish itself as the head of ocean-going navigation on the Willamette River, beating out the rival claims of Milwaukee and St. Helens. In particular, it benefited from the Ross Island sand bar that restricted access to Milwaukee and Oregon City. In the rest of the nineteenth century, commerce paralleled the Willamette. Ocean-going vessels connected Portland to the world. Smaller river steamers ranged upstream to Corvallis and Harrisburg. Riverboats even reached up the saffron-colored Yamhill River to Lafayette and McMinnville. Columbia River steamers and railroads made the young city the bustling entrepot for the vast Columbia Basin. Lumber and grain schooners crowded the banks of the Willamette to take on cargos for California markets. Lumber mills, flour mills, furniture factories, and packing plants soon followed. There were major factory nodes at Fulton (now the Johns Landing/Macadam area), at the Poulson lumber mill in what’s now the Brooklyn neighborhood, in Albina around the developing railyards, and in northwest (again between rail and river). Then as now, seasonal floods reminded Portlanders of the power of the natural environment. They built the city’s wharves in two levels–one for low water and one for high–and the great flood of 1894 helped to push downtown way uphill to 4th, 5th and 6th streets. The Northern Pacific Railroad filled Couch’s Lake for rail yards, and now for the housing of the River District. Guild’s Lake was utilized for the Lewis and Clark Exposition, then filled for industrial use, adapted for WWII housing, and then returned to industrial development. .
Dredging and fill also extended the Willamette River shoreline on the east side and turned wetlands into real estate. Southeast Union Avenue (MLK) originally ran on pilings over mud flats, leaving Grand the first dry business street. That’s why the warehouses of the Central East Side Industrial District date from the early 20th century rather than the 19th c.
The Port of Portland straightened the Willamette River at Swan Island in the 1920s, shifting the channel from the east side of the island to the west and attaching the island itself to the east bank. In turn, Rivergate was raised into dry land with the filling of Ramsey Lake.. In World War II, Tycoon Henry Kaiser, fresh from helping to build Boulder and Grand Coulee dams, opened the huge shipyards at St. Johns, Swan Island, and Vancouver. At the peak in 1943-44, metropolitan Portland counted 140,000 defense workers who built more than 1000 ocean going combat craft and Liberty ships. 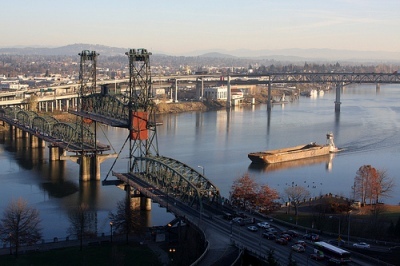 The renewal of Portland as an international port since the 1970s has continued land use trends first identified in the 1910s. Modern ports are great consumers of land for container yards and automobile processing, while larger and larger ships require deeper channels. As a result, the marine terminals and docks of river ports have tended to move steadily downstream. We can see this with London, Antwerp, and Hamburg . . . and also with Portland. The grain elevators at the east ends of the Steel and Broadway bridges are the last remnants of the old “downtown” harbor (there’s also a plaque on the East Bank Esplanade marking the site of Municipal Terminal Two that stretched between Washington and Oak). Terminal One has given way to redevelopment, so the action is now around Terminal 4 and the Rivergate complex at the confluence of the Willamette and Columbia rivers with Terminal 5 and Terminal 6. The shipyards are largely gone, but the river remains our economic focus. Portland is still the regional transportation hub and trading post for Oregon and much of Idaho and Washington. Downtown Portland is part of a vast riverside employment corridor. Within one mile of the Willamette River in Multnomah, Washington, and Clackamas counties are rough 200,000 jobs. There are two key questions for the next decade. First, how will the deepening of the Columbia River channel to 43 feet affect Portland and other Columbia ports (Longview, Kalama, and Vancouver, Washington) as the global economy recovers? Second, will the recovery of Port of Portland commerce be enough to trigger terminal expansion on the west end of Hayden Island, opposite Terminal 6?